One of the best of all of the Hakeas, red to orange flowers and attractive narrow or fine foliage make Hakea bucculenta a standout. The flowers are held back in the foliage, however still easily seen. This habit makes it a magnet for the smaller birds who can feel safe amongst the foliage while feeding. In its natural habitat it can reach over 6 metres in height, in cultivation usually around 3 -4 metres. 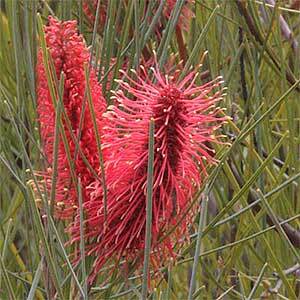 A pink flowering hybrid Hakea bucculenta x francissiana is also available. Use as a feature plant in the border, or plant as an informal screening plant at around 2 metres apart. Best grown in an open position where it gets good air flow. In clay and wet soils, hill up the garden bed before planting to improve drainage. Add a little well rotted cow manure and aged compost. Common Name – Red Poker Hakea. Foliage – Narrow, mid green.